I felt a great disturbance in The Force, as if millions of fans suddenly cried out in terror. Whenever a longstanding franchise decides to try something bold or different that deviates from its legacy, there's bound to be some blowback. Throughout the beloved original trilogy and the not-so-beloved prequels, Star Wars may have incorporated peril, tension, and death into the storylines, but there's always been a relative safety net underneath the characters that befits the space-opera serial genre. That safety net involves the presence of hope regardless of the situation, where the filmmakers responsible for a certain installment in the series are, in one way or another, beholden to a degree of restraint involving unchanging character motivations and the prospects of a triumphant outcome. Some may consider these the "themes" running throughout the series, and others will attribute perceived depatures from those core pillars as the product of faulty writing. Looper and Brick writer/director Rian Johnson has and will continue to face these criticisms for a long time because of The Last Jedi, largely due to how he's taken the franchise in daring, borderline avant-garde directions that -- perhaps recklessly -- plow through the safety net. The state of the universe in this eighth episode of the Star Wars saga, which follows very shortly after the events of The Force Awakens, isn't unlike the state of the universe following the events of A New Hope, the very first film in the series. The First Order, something of a reemergence of the Galactic Empire, has suffered a profound defeat at the hands of the Resistance: the destruction of the Starkiller base. This didn't come without casualties, though, leaving them without Han Solo and healing the heroic ex-Stormtrooper Finn (John Boyega) after his encounter with the menacing Kylo Ren (Adam Driver), who in turn was defeated once Rey -- a scrapper from a sandy planet -- began to discover her sensitivity to the magic abilities of The Force. Once discovered by The First Order, the Resistance finds themselves evacuating their base and on the run from a massive fleet, but not without unleashing a counterattack that betters their chances of survival. 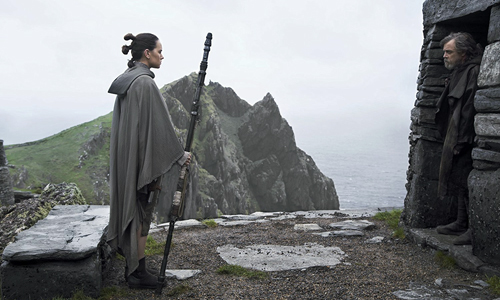 Caught in a stalemate of sorts, the Resistance must figure out another escape plan … while elsewhere, Rey (Daisy Ridley) arrives at the island that houses who could become a key element of the Resistance: the reclusive Luke Skywalker (Mark Hamill). Despite being a box-office hit and a credible rejuvenation of the Star Wars franchise following George Lucas' divisive prequel trilogy, The Force Awakens took a beating for its resemblances to the original A New Hope, too many to succinctly recap here. The Last Jedi isn't devoid of this in its mirroring of the original trilogy's first sequel, The Empire Strikes Back: both involve a strategic pursuit after the enemies force the rebels to evacuate their secluded base, and both involve the isolated training of an emergent Jedi whose powers are desperately needed on the rebellion's side. Rian Johnson's script camouflages these similarities more skillfully and intricately than its predecessor, though, and he does so through the strengths and weaknesses of the characters involved, who take on more distinctive traits this time around. The plotting is rather unique, in which events happen around the momentum of a conflict that, by design, doesn't seem like it's moving forward, employing stalling tactics and heated discussions between raucous "flyboy" Poe (Oscar Isaac) and his cautious superiors, including General Leia (Carrie Fisher). With The Last Jedi, Rian Johnson found a way to bring indie-movie or serialized television boundaries to the sprawling scope of the Star Wars franchise, a brave endeavor for a genre that typically doesn't benefit from slowing down to let the audience ponder how it might violate whatever narrative rules have been put in place. Johnson hopes that the strength of the characters, both old and new, distracts from any of those concerns … which they do, for better and for worse. We're introduced to one of this new trilogy's most compelling new faces, Vice Admiral Holdo, played by Laura Dern, whose stern practicality yet underlying comforts of wisdom position her as a layered female leader. 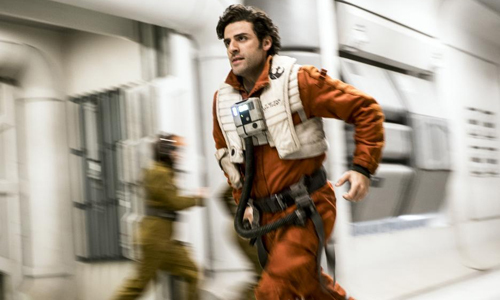 Her interactions with the brazen, good-intended maneuvers of Oscar Isaac's Poe make up some of The Last Jedi's strongest dramatic movements. The late Carrie Fisher's sagely presence as General Leia endures a challenge in what'll be her last full outing as the character in the Star Wars saga, in which unique elements of her lineage are revealed -- somewhat clumsily -- amid the chaos of battle. A solution to the First Order's slow crawl toward the Resistance does need to be discovered, and that largely occurs outside the inert chase, on a distant planet populated with gambling and excess that brushes against social critiques on the wealthy and elite. 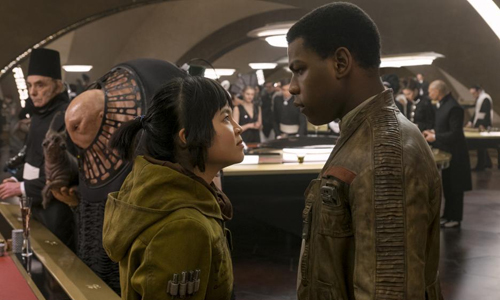 Johnson also brushes against the excess of new scenery and visual effects akin to the prequel trilogy in his rendering of this destination, Canto Bight, in which Finn and new character Rose (Kelly Marie Tran) -- an (Asian!) engineer who has recently suffered a family loss -- hunt for an alternative, more daring solution to the Resistance fleet's problem. Large computer-generated creatures, extensive overhead renderings of the scenery, and hokey representations of those that populate this new wretched hive of scum and villainy make for a sluggish and heavy-handed dip in the film's momentum. The interplay between Rose and Finn occasionally elevates those scenes with levity, but Johnson's overt attempts at brightening the mood in what's ultimately a grim corner of the Star Wars universe can ring false, partly due to Rose's exaggerated dramatics. Obviously, indicated by the title, the more intriguing elements of The Last Jedi occur elsewhere, in the presence of those navigating The Force. That includes the return of Luke Skywalker, whose transformation in personality over the course of thirty-some-odd years strikes a specific chord with fans of the series. In the presence of Daisy Ridley's eager yet fearful Rey, whose attunement to The Force has left her wanting to discover more while on a quest to draw the Jedi master back into the throes of battle, Skywalker exhibits resistance to her pleas and something resembling disdain for the mystical powers that ultimately saved the universe from the reign of the Emperor not so very long ago. Mark Hamill's performance is marvelous, allowing touches of the wistful Skywalker of his youth to peek through the grizzled, cynical attitude he's developed over time, which was at least partially established and foreshadowed in The Force Awakens. Appreciating his defeated gloominess and lack of gravitas can be complicated, though, calling into question the consistency of his character. Watching where Rian Johnson takes their usage of The Force becomes both the most absorbing and most maddening element of The Last Jedi, mostly on the absorbing end of the spectrum. The experience of Rey zeroing in on the intensity of her connection to the mystical side of the Star Wars universe becomes entrancing, where her dance with both its light and dark sides recalls Luke's own experiences with Yoda in Empire. Visual panache enhances the duality of it all, where the imagery captured by Johnson's regular cinematographer Steve Yedlin descends into the earthy roots of both the island and what it means to tap into that kind of power. Skywalker's individual perception of The Force, which approaches it from a uniquely nonaligned angle, also lends her learning experience a bit of genuine philosophical weight beyond merely harnessing good power and shunning the bad. Johnson also finds a gripping way of incorporating the Jedi's ability to feel one another's presence and employ their ability to "hear" one another. The magical side of the Star Wars universe flourishes here. Alas, this also proves to be The Last Jedi's most contentious, albeit mesmerizingly executed characteristic once the stakes have been elevated in the final act. As writer/director Rian Johnson draws together the previous narrative threads into a sequence of high-stakes escapes and battles, he bravely emphasizes personal sacrifice in a greater capacity than previous Star Wars films have done, which results in a melancholy feeling that flows throughout the end of the film. While stunning in execution and impacted by the plucked heartstrings of nostalgia, his devices also challenge preconceived notions about what's possible in the universe, especially in terms of the expansiveness of The Force's reach across time and space. 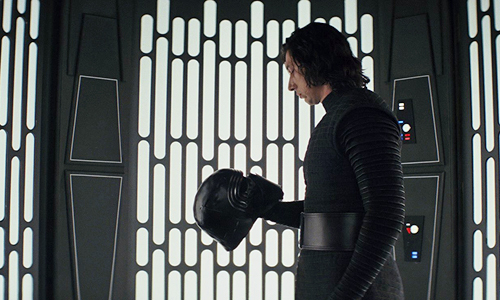 Sure, there's abundant suspension of disbelief involved with space wizards and their mental tricks, prisoners encased alive in carbonite, and destructive space stations the size of small moons, but The Last Jedi heavily relies on leaps in ability only faintly and vaguely hinted at beforehand, for the sake of pull-the-rug-out surprises. Whether Johnson's audaciousness deserves to be cheered or lambasted -- probably a bit of both -- he certainly ends this middle entry in the modern Star Wars saga with a hopeful bang.